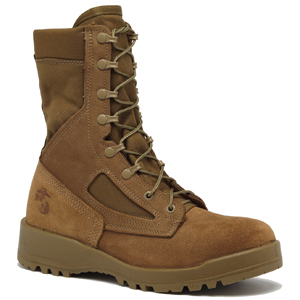 The Belleville 590 is a rugged boot built for Marines. Several comfort features make this boot one of the most comfortable options on the market such as Bellville's patented VANGUARD running shoe sole construction which absorbs shock while providing flexibility and cushioning. The 590 is designed for hot weather use and features an unlined upper made from full grain cowhide suede and a abrasion-resistant nylon. A VIBRAM Sierra outsole features large multi-directional lugs and provides excellent all around traction. It also proudly displays the USMC's globe and anchor logo and is approved for wear with the Marine Corps Combat Utility Uniform (MCCUU). This boot is Berry Compliant and proudly made in the USA. I bought these for my husband. He says they are one of the most comfortable boots he's ever had and loves them for their durability. I had bought these boots mainly for when I go paintballing. I didn't order them ahead of time for a special event so I didn't get a chance to break them in. They worked out for me as it was a three day long course of running around in them for 6-8 hours a day. They were very comfortable and helped me avoid a twisted ankle with a few slips in rocky terrain. I had to return the first pair because the boot lace eye holes did not line up at all. The second pair was good. I bought this Goretex model (590) rather than the summer version (500) because I like a thicker layer for padding and Goretex is always a plus. I've worn these in 90+ degree temps and my feet were fine. They're not ideal for hot weather but bearable. Very comfortable. This is my third pair in the last 5 years. These boots take a beating every day Monday through Friday with USMC pt, training, ops, etc.. Gore Tex works great and keeps my feet dry. They're comfortable, provide excellent support, and are breathable. Great work, Belleville! I got these for training before I entered Marine Corps Basic. My recruiter said I should train with weights and 5-10 mile daily runs to get my physical conditioning up. I bought these boots online and I've been training every day in them for three months now. Since they are my first pair of boots, I don't have anything to compare them too but they do feel heavy. They are definitely getting me into shape though as i have lost 7 lbs and a pant size so far. They are burly though and they are hard to sprint in. Other than that, they are good boots for climbing and they do grip well on loose dirt.